The Innova 3140 is a tad on the expensive side, but it promises an array of features, many of which cannot be found on competing car scanners. Users have the option of reading test results on the scanner’s integrated screen or reviewing them on the screen of a Windows or Mac computer. ABS codes, SRS codes, and “Check Engine” warnings can all be managed with this scanner, while its free internet updates eradicate the risk of it being rendered obsolete. This scanner is available in a black and white screen model, as well as a color screen model. You also have the option of purchasing a Bluetooth model. The Innova 3140 was designed to be used by DIYers and professionals alike. However, those who fall into the latter category will have the easiest time justifying a purchase of the scanner. Selling for over $250, the Innova 3140 should only be purchased by those who are confident they will use it on a regular basis. If you’re a mechanic, you’ll likely be using your chosen scanner on a daily basis, so the 3140 should be high on your shopping list. It will likely pay for itself after a month or so of use. Car owners who only carry out the occasional repair and tend to their vehicle out of necessity rather than passion need not purchase the Innova 3140. Hobbyists who carry out car repairs on a regular basis, however, will benefit from having a professional-quality tool in their arsenal. 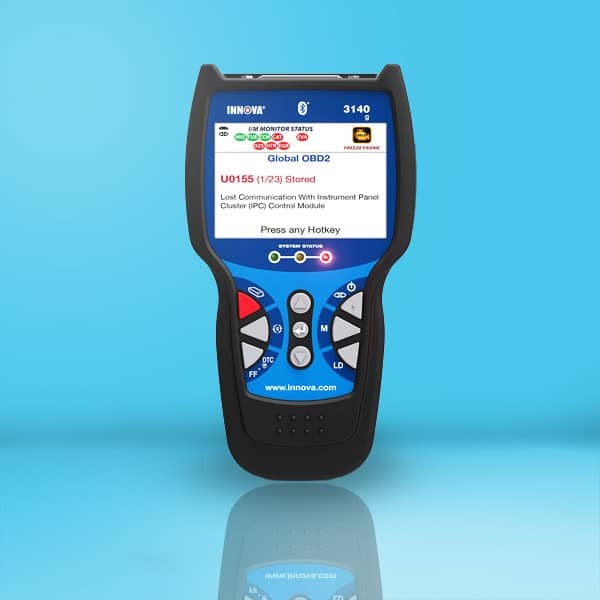 Should you decide to purchase the Innova 3140, you can expect to receive the car scanner itself, along with an insert card, an OBD2 cable, and multiple OB1 adapters. A USB cable and 3 AA batteries are also included in the box, as is a branded pouch for storage and an instruction manual for easy setup. The Innova 3140 is quite a bit lighter and smaller than many similar car scanners, which is a definite plus as it allows the user to hold it for an extended period of time without strain on their back or arms. While it does mean that the screen is slightly more difficult to read than that of a larger model, having the option to connect the device to a Windows or Mac computer makes such an issue virtually irrelevant. We really love the 3140’s live data capabilities. With the ability to stream and record data for playback at a later time, this scanner makes in-depth analysis of a vehicle and its condition easier than ever before. Along with its service light reset abilities, the 3140 can read and erase both ABS and SRS codes on the vast majority of OBD1 and OBD2 vehicles and is compatible with models from Ford, Chrysler, Toyota, Honda, and General Motors. The OBD2 connecter with which this scanner comes packaged boasts LED lighting, which makes locating your car’s OBD port significantly less challenging. If you’re trying to stock your automotive arsenal on a budget, the Innova 3140 certainly isn’t the car scanner for you. If you don’t mind spending a little extra to get a high-quality product, however, this is most certainly worthy of your consideration. With its ability to record and playback data, along with its compatibility with most OBD1 and OBD2 vehicles, as well as Windows and Mac computers, the 3140 promises the professional almost everything they need to triumph over competing garages. Meanwhile, these features, backed by Innova’s bilingual customer support and guidance, grant the dedicated automotive hobbyist the ability to provide a service one would expect from a professional mechanic.